Hu Bei Cha Ye Xue Hui Jin Jiang Chan Pin (Hu Bei Institute Gold Award Product) in year 2006, 2007, 2008. Hu Bei Sheng Di San Jie Shi Da Ming Cha (3rd Hu Bei Province 10 Famous Tea Award). Di Qi Jie Zhong Cha Bei Yi Deng Jiang (7th China Tea Cup First Prize). This tea also has a long history. En Shi City was known to produce tea since the Tang Dynasty (618-907). History records suggest that En Shi Yu Lu was first created during Emperor Kang Xi's reign. It was not always processed by steaming. The processing method was improved from frying to steaming in 1936 by "Yang Run of Hubei Province Min Sheng" Tea Company. 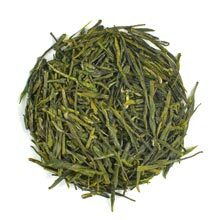 In 1945, En Shi Yu Lu was introduced to Japan and it was so well accepted that it was called “Chinese Gyokuro”. The liquor is very clear but the taste is not weak at all. It has a distinct floral sweetness and a pleasant aftertaste. Very refreshing and special. We recommend using less tea leaves and water temperature of 60-70°c for this tea. Only one-bud-one-leaf tea leaves picked from early spring season are used to make En Shi Yu Lu. Its shape is long and narrow. The infusion is very light (almost colorless) jade green.